This jumbo Irish tie with shamrocks it a great accent for you St. Patrick's Day costume. 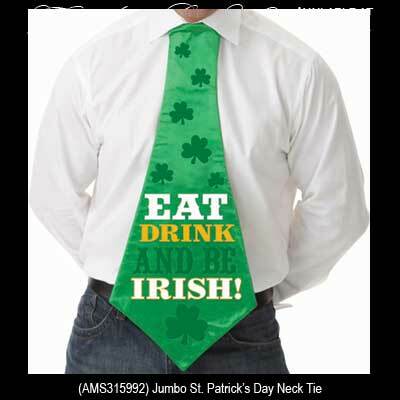 Eat, Drink and be Irish is the message on this shamrock tie. This huge shamrock tie measures 10" wide x 24" long and it will look sporting at all your St. Patrick's Day parties. The 100% polyester St. Patrick's Day tie from The Irish Gift House has an elastic neckband and the one size will fit most.